Many players, on reading a text box like Ghalta’s, will leap immediately to thinking about the elusive promise of a 12/12 trample for two mana. Just for reference, that’s what you get with the legendary combo of Phyrexian Dreadnought plus Stifle. Ghalta requires you to commit quite a lot of cards and perhaps a lot of mana to the table before you get there, but that can be okay – it just implies a different style of deck construction, in which Ghalta is a finisher or an “oh man, what next?” sort of card which takes advantage of their defenses being exhausted. You can also keep an eye out for cards like Raise the Alarm that generate more than one creature, for creatures like Jadelight Ranger that can have more power than printed on the card, and for creatures like Vinelasher Kudzu which grow over time. These are good on their own, and make for some nearly unsolvable dilemmas when backed up by Ghalta. Cost reduction can be dangerous, and Ghalta certainly promises a fair bit on that front: a 2-mana 12/12 with trample is no joke, let it be known. 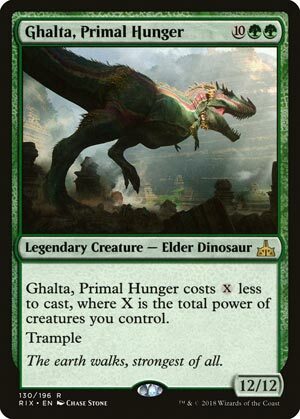 Ghalta becomes cheaper with a large army or with a large creature, and it’s also in green (the color known for the biggest and cuddliest creatures). Ghalta predictably is not a fan of spells that abuse its lack of protective keywords, but if you can resolve this rather large Dinosaur, you should be able to make quick work of an opponent. The only time Ghalta is bad is if you’re trying to recover from a board wipe or you simply lack creatures, but being in a tribe with a lot of massive creatures (Dinosaurs) and in the color with the largest creatures helps offset that somewhat. Ghalta makes for a fine “answer me now” threat in any deck that can reliably support double green.